Sporadic Sentinel: Kansas Football: Is Les Miles More or Fewer? 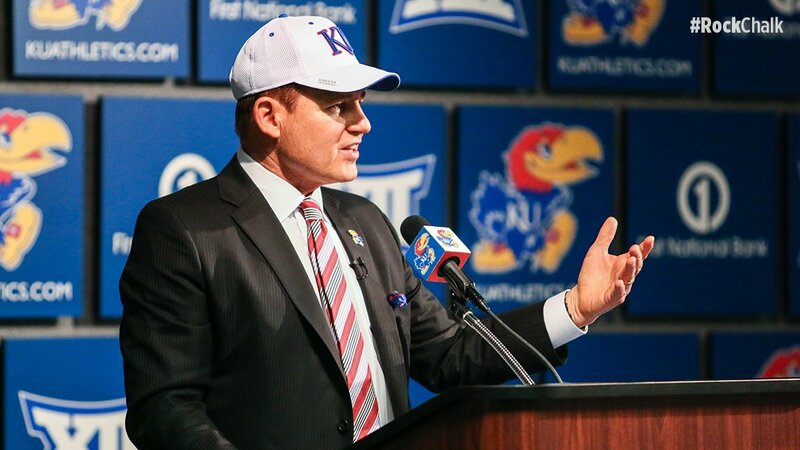 Kansas Football: Is Les Miles More or Fewer? A long time ago, when my non-sports fan family discovered the name of the then-LSU head coach, they were appalled. Being English majors and VERY knowledgeable about the use of plurals, they are more than happy to tell you when you use plurals wrong. Especially the difference between "fewer" and "less." It's incorrect English to say you have "less things." If it ends with "s" you (most of the time) use "fewer." It means you have "fewer things" and you have "less stuff." So when they discovered the LSU football coach was named "Les Miles," like I said, they were appalled. They didn't understand how his parents could have intentionally done that and made that big of an English grammatical error. So we jokingly called him "Fewer Miles." Every place I have worked, and Les Miles has come up in conversation, I have told that story. Little did I know then, years ago when "Fewer Miles" was named, that he would become Kansas Football's head coach. My alma mater's head coach. Who cycles through head coaches like I do jobs. I will continue to tell anyone who will listen that David Beaty got a raw deal as KU head coach. There have been a lot of KU coaches who brought their dismissal upon themselves. A lot. Beaty was put in a place where he needed at least seven years to become successful, because his first year KU had 38 scholarship players (I wrote about this) and when Penn State lost a bunch of scholarships because of their scandal they were reduced to 65 scholarship players, or the amount of players Beaty finally had on scholarship THIS Year, in his 4th year. He was not put in a very good place to succeed. 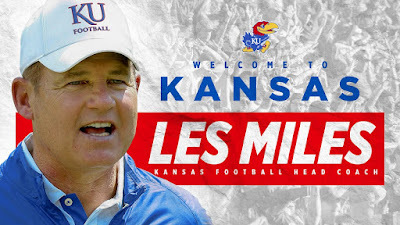 As a result, when we all found out that new Athletic Director Jeff Long was friends with Les Miles and had been for at least 20 years, Beaty and all of us knew his days were numbered if he didn't take KU to a bowl game this year. No coach can win six football games in a season with 65 scholarship players, unless his name is Saban. Thus, Beaty is out and Miles is in. Which, if you've been following KU football for several years, is exactly what got Beaty hired, and Charlie Weis hired, and so on and so on and so on. The pattern is this: Athletic director hires new football coach, whom he knew previously. Football coach does poorly. The athletic director leaves his position, voluntarily or otherwise. Football coach continues to do poorly, and leaves his position, voluntarily or otherwise. Athletic director hires new football coach, whom he knew previously. There is another, ominous pattern here: The previous experience of KU head football coaches. Coach Ever Head Coach before? KU record why did he leave? Les Miles yes ?? ?? Anything jump out at you? For me, it's after Glen, everybody who'd been a head coach before was terrible. As for the guys who hadn't been, well, you know how I think Beaty got screwed, and Mangino won as many bowl games as KU had COMBINED in the previous 100-whatever years of the program (of course only 20 schools went to a bowl game a year until ESPN realized it was a teevee cash cow and now 70 schools go to a bowl game a year). The next big strike against Fewer Miles is his age. He's 64, easily the oldest guy on this list whether you count age of first game or age of last game. When I was there in the Glen Mason era I thought he was easily in his 50's, maybe 60- and he left for the Minnesota job when he was 47. Weis was hired when he was 55. Mangino is the same age as Weis, meaning he was hired when he was 46, or one year younger than Mason when he left. Beaty was 44. A 64-year-old is gonna turn this thing around? A 64-year-old who was fired at LSU partially because he refused to change his offense? Is it too soon to fire Fewer Miles for Kliff Kingsbury?